A touching note written by a person who uses a wheelchair has gone viral online after it was spotted by a local rowing club and shared on Twitter. 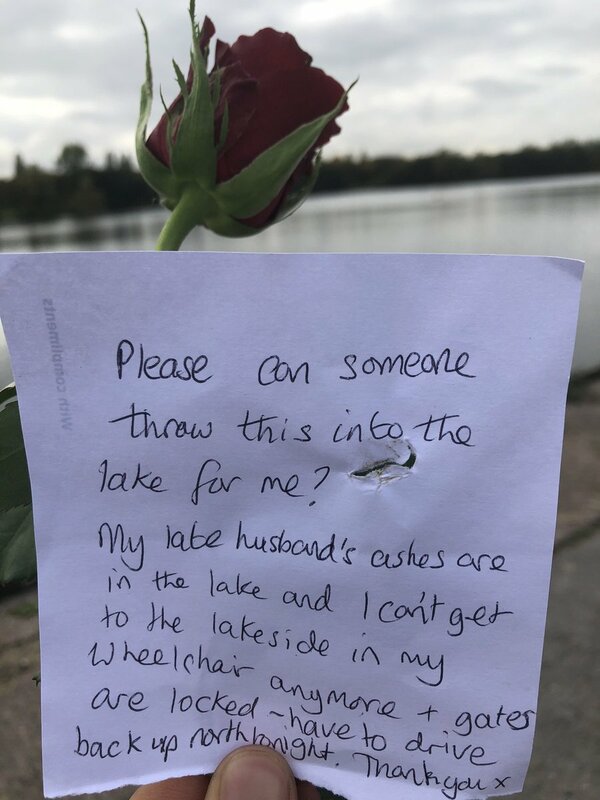 Attached to a single red rose, the note was left on a lakeside gate in Sutton Coldfield, Birmingham in England; its anonymous author had asked for someone to throw the flower into the water to honour their late husband, which they were unable to do themselves due to accessibility issues. “Please can someone throw this into the lake for me,” the message begins. “My late husband’s ashes are in the lake and I can’t get to the lakeside in my wheelchair anymore + gates are locked - have to drive back up north tonight. Thank you x”. The small piece of paper was noticed by members of Bishop Vesey’s Grammar School Rowing Club, who posted a photograph of the note on Twitter alongside a second snap showing the rose had indeed been thrown into the middle of the lake as requested. “This note was left on the gate at the water this afternoon,” the tweet reads. Since it was posted on Thursday, the tweet has garnered more than 62,500 likes and 18,000 retweets, with thousands of people from across the globe praising the rowers for their kind gesture and explaining how the story had warmed their hearts. “I hope that this woman knows that her message went viral, and is being appreciated in the United States,” wrote one person. “I have just read that note. It has brought tears to my eyes,” added another. Some people expressed disappointment that the person had been unable to access the lake on their own due to their wheelchair. “There are so many reasons that actually accessible communities are important,” wrote one person.